Students at Newcastle University recently teamed up with engineers and architects to build a pop-up café made entirely from recycled plastic bottles and cardboard boxes. 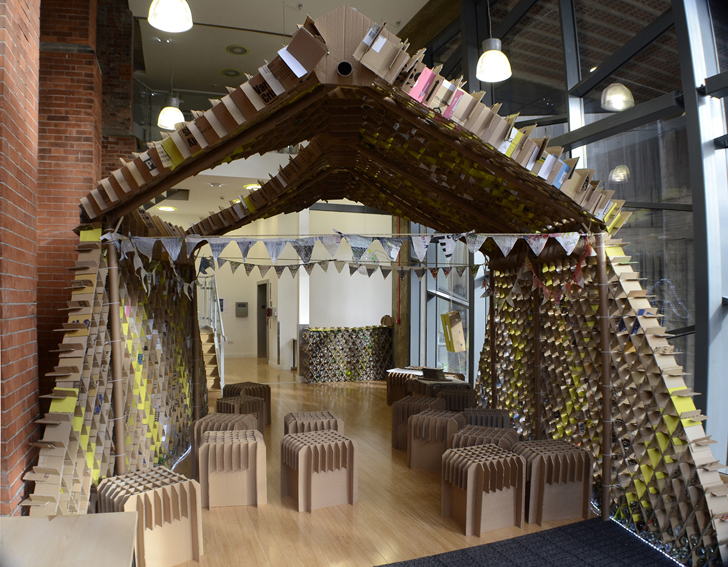 The Trash Café is part of the University’s larger recycling initiative, which aims to spread environmental awareness among young designers and motivate them to use sustainable materials. The plastic bottle chairs and cardboard walls of the cafe will be dismantled and flat-packed at the end of the week to be moved to other locations in Newcastle. The waste material was collected by 18 postgraduate students who worked with engineers to design the basic elements of the café. 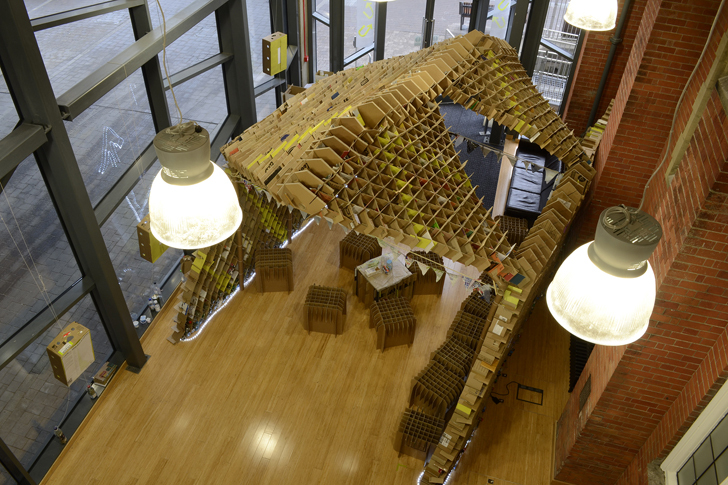 Funded by the Engineering and Physical Sciences Research Council (EPSRC) and conceived by civil engineers professor Stephanie Glendinning, Dr. Mark Powell and Director of Architecture Graham Farmer, the project aims to encourage people to think and behave differently towards food and product packaging. “Upcycling is about taking material that would normally be considered waste and turning it into something of value,” explains Dr Powell, one of the authors of the project. The Trash Café is located on the Newcastle University main campus in the new Fine Art Lobby opposite the Northern Stage. Visitors will be able to enjoy a free cup of coffee and listen to Newcastle University band “Junk Agency,” who will perform music made by sampling CDs and discarded cassettes. On Thursday April 18 the café will be dismantled and moved to another location. It will be part of this year’s British Science Festival in Newcastle next September. The project aims to change popular perspective on food and product packaging. The plastic-bottle chairs and cardboard walls of the cafe will be dismantled and flat-packed at the end of the week to be moved to other locations in Newcastle. The waste material was collected by 18 postgraduate students who worked with engineers to design the basic elements of the café. The project will be part of this year’s British Science Festival in Newcastle next September. On Thursday April 18 the café will be dismantled and moved to another location. It will be part of this year’s British Science Festival in Newcastle next September. It was conceived by civil engineers professor Stephanie Glendinning, Dr. Mark Powell and Director of Architecture Graham Farmer. The Trash Café will be located at the Newcastle University main campus, in the new Fine Art Lobby opposite Northern Stage. Visitors will be able to enjoy a free cup of coffee and listen to Newcastle University band "Junk Agency," who will perform music made by sampling CDs and discarded cassettes.